Here raining heavily today.and wish to crave some hot crispy and spicy with hot filtercoffee for this rainy evening. There was some raw banana's in the fridge and I decided to make bajji with it. It's a easy snack to make, and right for a rainy day with tea or coffee. Bajji is a simple dish prepared by dipping the sliced vegetable in the batter and deep frying it. 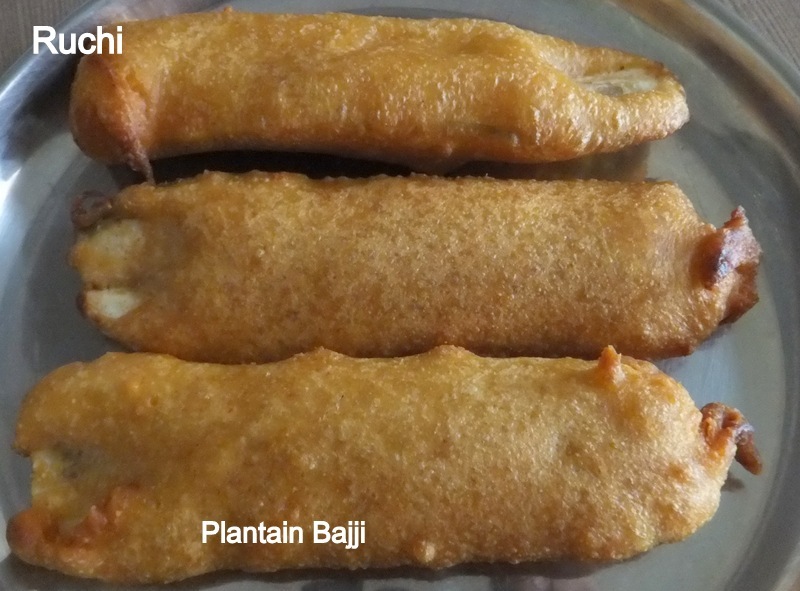 For bajji vegetables most commonly such as onion,potato,plantain,eggplant,ridge gourd are cut into thin round discs and are dipped in little spiced chickpea ,rice flour combined batter.Other veggies and greens like cauliflower ,cabbage and spinach are also commonly used. 1 ) Make a thick batter by mixing besan, rice flour, chili powder, ghee, salt to taste along with enough water. 2 ) Cut banana into thin slices longitudinally. Discard the skin on both edges of the banana, if you do not prefer the skin. 3 ) Heat oil in a kadai or wok. Dip and coat each banana slice well with the batter and deep fry in medium hot oil till golden brown in color. Drain out of the oil and place in a platter to serve.